This property is set by the Eskifjördur waterfront. It offers free Wi-Fi, a shared kitchen and lounge. The larger town of Egilsstadir is 50 km away. Guesthouse Askja’s rooms feature bright, minimalist décor and pine furnishings. Bathroom facilities are shared. A stove, microwave and tea/coffee facilities are found in the communal kitchen. The lounge has a 50-inch flat-screen TV and free internet computer. Laundry facilities are also available. Rowing boats and fishing gear can be rented on site. Passes are also available for Oddskard Ski Area, which is within 20 minutes’ drive. Askja Guesthouse is just 200 m from the nearest restaurant, which serves typical Nordic dishes. 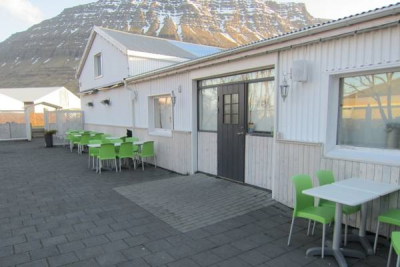 Situated in the fishing village of Eskifjördur, this hotel offers rooms with free Wi-Fi access. The Maritime Museum of East Iceland is a 7-minute walk away. A seating area, wardrobe and an in-room wash basin are featured in all rooms at Kaffihúsid Eskifirdi. Each room has access to shared bathroom facilities. Breakfast and à la carte dinner dishes are served at the in-house restaurant at Kaffihúsid. Drinks can be enjoyed in the bar. Guests can relax on the terrace with views of the Eskifjord and the Holmatind Mountain. A game of table tennis can also be enjoyed on site. A geothermal swimming pool and fitness centre is located 200 m from the guesthouse. Oddskard Ski Centre is 12 km away.